Have you ever gone out of your way to help someone, just to be kind and generous, and it backfired? How is it that you start out intending to do something that will make a group of people a little happier for your contribution, and suddenly, the equation gets an added and unexpected factor that takes what should have been the happy end result and, instead, steers your “Happiness Vehicle” onto a mind-numbing roller coaster track with no brakes. My most memorable example of that phenomenon was on a night when a group of ladies wanted to meet their favorite singer, and being a young, somewhat naïve, college student with connections, I thought, “Why not?” Did it matter that the person they wanted to meet just happened to be the world’s most famous singer? No. And what followed that seemingly innocent decision led to the most embarrassing prank I ever pulled, because it was on none other than...Elvis Presley. 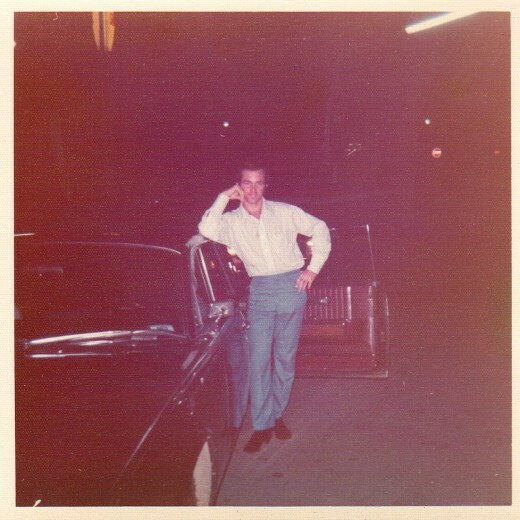 The year was 1972, and I was in my junior year as a college student at Lee College in Cleveland, Tennessee. I knew that Elvis was going to be performing in Knoxville at the University of Tennessee Stokely Athletics Center on April 8th. Rumor around campus was that I was Elvis Presley’s cousin, which is true, but not in the sense that I could just go call Elvis at home and chitchat. 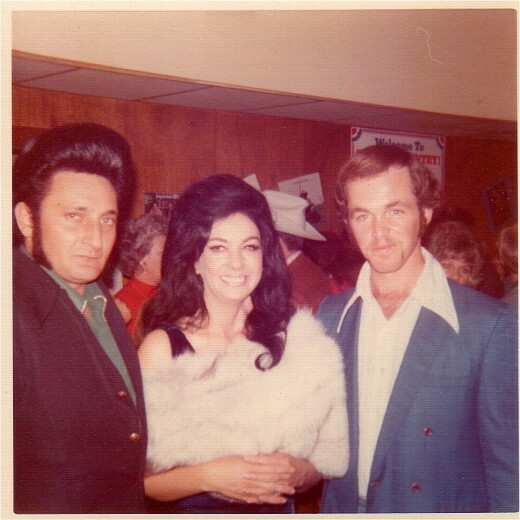 My father’s grandmother was a Presley, but it’s a long story. 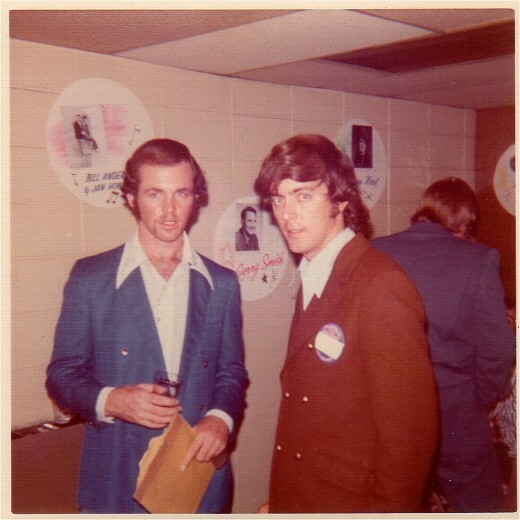 Nonetheless, when word got out that Elvis would be in concert near our campus, there were suddenly a few “new” best friends coming out of the woodwork, and while I was flattered with the undue attention, only one person was going with me, my friend Robert Surface. I guess I just related to Bob’s basic shyness and genuine personality. 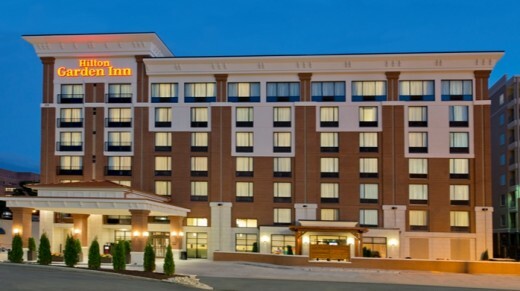 So, on April 8, 1972, Bob and I drove up to Knoxville, an hour north of the campus, and headed for the Sheraton Campus Inn on West Cumberland Avenue. Elvis had taken over the top two floors of the hotel, something he routinely did for every place he stayed. The top floor was for his close associates, and the second floor was always for the rest of the entourage, like the backup singers and road managers. 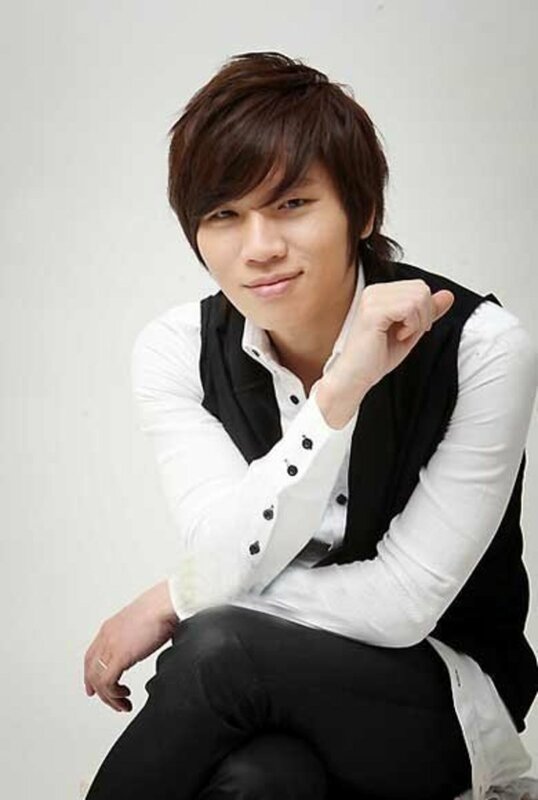 If a fan somehow found out that Elvis was staying at a particular hotel and tried to get to that floor, the fan would be met with police and security personnel as soon as the elevator doors opened on those two floors, and the fans would be told that they could not exit on that floor. Security for Elvis and his entourage was always extremely protective, sometimes overly so. 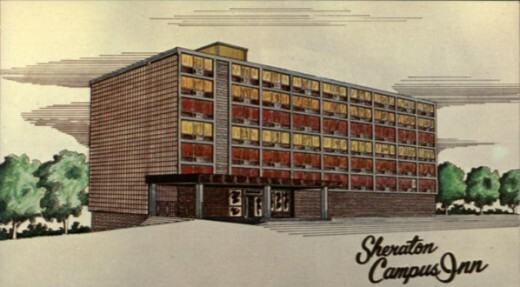 The Sheraton Campus Inn had been built just three years prior to this, so it was a new hotel at the time. There was a lot of tension in the air in that place, because the press had been strictly warned to stay away, and anyone with a camera would have been given a rough time. I think a lot of that was Colonel Parker’s doing, a deliberate machination to increase the desire to see Elvis, because one of the things Colonel Parker always liked to say was, “You don’t get Elvis for free.” I have to laugh when I think what a commotion I caused whenever I went out that front hotel door, because I was dark-haired, six feet tall, wearing Elvis’ trademark sideburns, and I was dressed in a black jumpsuit with bell bottoms (the fashion at that time). I remember seeing photographers looking at me from across the parking lot with the same look a deer hunter gives a movement in the woods. Their cameras came up every time I went out that door...still brings a smile and a chuckle when I think back. 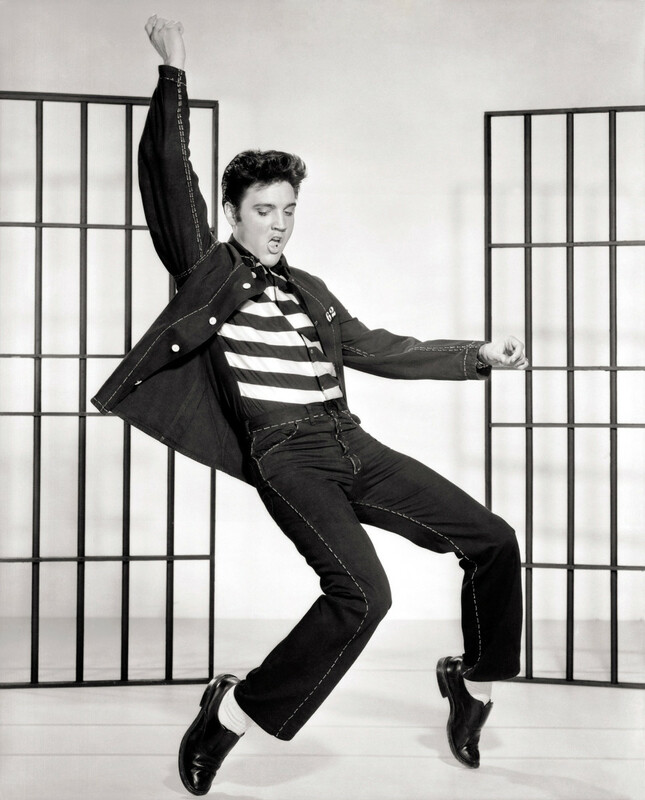 Elvis had two shows that day, one around 2:00 o’clock in the afternoon, and one later that evening around 8:00 o’clock. Just as I arrived in the lobby of the Sheraton, the elevator door opened for a moment, and there, crammed in with his entourage, stood Elvis, dressed in one of his famous rhinestone-studded jumpsuits and wiping his face with a white towel. He was still “hot off the stage,” so to speak, since the Stokely Arena was just blocks away, and the limousine had literally taken him directly from backstage to the hotel. I turned, and we locked gazes just as the elevator door began to close. Someone had accidentally hit the wrong button, and Elvis was unceremoniously “shown to the world” on the lobby floor. The door had opened and closed so quickly, there wasn’t any time to communicate, but I wasn’t worried. I knew that we would be getting together later on anyway. 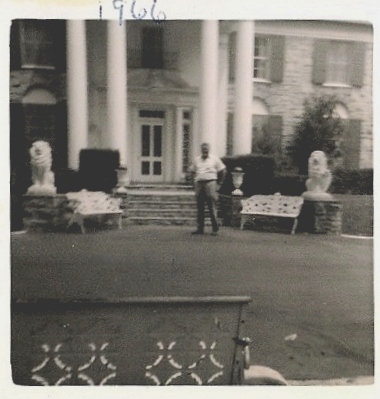 I had several photos taken at Graceland, one of them being a photo of my sister, Sandra, and Vernon, Elvis’ father, that was taken in 1966 on the front steps of the house. Those were gentler times, and I always treasured those photos. One of Elvis’ cousins was at the house that day and used my sister’s camera to take a picture of all of them together. 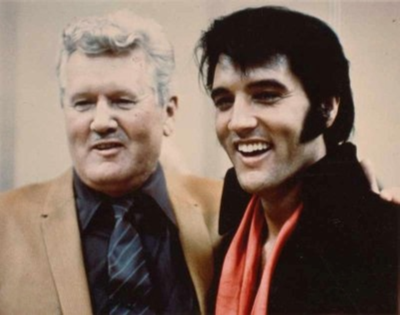 I thought Vernon would enjoy seeing that photo, so I brought it with me, and later that afternoon, I sent it upstairs to Vernon through Joe Esposito, Elvis’s right-hand man. Joe was someone Elvis trusted to handle anything and everything, and he had been with Elvis since their days together in the Army. So, seeing that Joe was near by, I asked him if he would make sure that Vernon got the photo. Imagine my surprise when, a bit later on, the hotel manager, a very kind gentleman, came to me and handed me the photo. He had found it on the hallway floor near Joe’s room. Careless? I thanked the manager, quietly tucked it into my pocket, and later, when I was having dinner with Vernon, I pulled it out and handed it to Vernon, saying, “I sent this up to you by Joe, but the manager found it on the hallway floor.” Joe was embarrassed, and said, “It must have fallen out of my pocket.” Vernon tucked it into his shirt pocket for safe keeping, and I was not about to tell Vernon that the photo was not a gift, but my only copy. Thus the reason that that particular photo is not included in this article (unless my sister finds her copy for me). Poor Joe, he must have felt that I was setting him up, because while we were talking, my friend, Bob, had been standing behind him with his little tape recorder, I suppose recording our conversation for “posterity sake.” The timing could not have been worse, and I had no idea that he was going to do this. I hadn’t even noticed until Joe did, and when he did, he looked around at Bob, looked at the tape recorder, which I now noticed was on, and demanded, “What are you doing? Is that thing on? Shut it off!” Now it was my turn to be embarrassed, but I just quickly diverted the attention away from Bob and back to the conversation. Needless to say, Joe was following Colonel Parker’s edicts. My sister, Sandra, is on the right. Her friend, Bonnie, is on the left. I guess it was the sideburns that had all those photographers camera happy when I stepped out of the Sheraton. That sounded simple and innocent enough to me. If there were any thoughts of how this might go wrong, the ladies were very convincing that they were going to conduct themselves well. One of the ladies spoke to the others and said, “Now, girls, we are not going to scream or make any scenes. When Elvis comes by, we are going to act like ladies. If he wants to talk to us, we will talk, but we are not going to ask for any autographs, and we are going stay calm and collected. We want Elvis to be proud of us.” The other two listened with a strange look in their eyes that seemed to say, “Our ears hear you, our heads are nodding in agreement, but our bodies are in disbelief, and we are not sure what we are doing right now.” Hey, I was convinced. Their ringleader, a woman so drop-dead gorgeous that Tom Jones had seen her from the stage of one of his concerts and had sent an aide out to her with an extra room key, was definitely going to keep order with the trio...or so I thought. There would be no screaming, no making any scenes, Elvis would find a calm, serene group of beautiful ladies just coincidentally standing near the elevator that he was about to use. 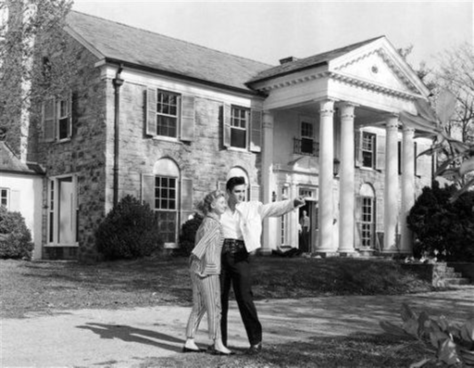 Certainly, there would be a little “light banter,” Elvis would go on to the top floor after maybe having signed an autograph or two, and all would be well. These sweet ladies would get their wish, and I would go on about my business for the rest of the evening. But, that is NOT how it all went down! There suddenly came the sound of the rubber of car tires squealing as they execute a tight turn against smooth concrete. Like an alarm that suddenly awakens you from a deep sleep, and a subliminal alter ego inside of you sits upright and stares in bewilderment, that is the look that instantly came across the faces of those three ladies. For the first time since hatching this nefarious plot, I had second thoughts. Then came the sound of the car doors slamming shut, and any chance of my changing direction was forever likewise sealed. Around the corner came Elvis with Joe Esposito, several other members of the entourage, and one security officer. 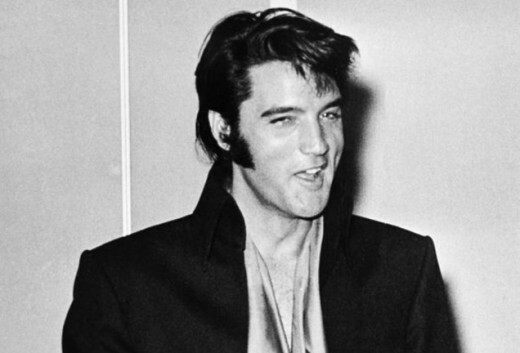 At the sight of Elvis, the ladies began that same ear-piercing, caterwauling shriek that I had endured at the concert. I backed away. I shot a glance at the two elevator doors. I now regretted that, moments ago, I had reached inside both elevators and punched the buttons for all the floors, then sent them on their way, all in a kind gesture to give these sweet ladies, who had promised to behave, a little more time with their hero. Now, I was praying that somehow, those two elevators were on their way back down. No luck. The ringleader, who had given such a wonderful speech just minutes ago, was now throwing herself at Elvis, who was being protected by the entourage that had locked their arms to form a human barricade and were doing their best to hold back the siege. Somehow, despite that arms-locked barricade, this one lady had managed to jump up and wrap her arms around Elvis’ neck and, with lips puckered in determined anticipation of reaching her goal, was desperately trying to kiss him. Well, she already had her arms around his neck, so Elvis was trying to gallantly oblige. Trouble is, the other two were still screaming like two rabid Chihuahuas and charging the barricade like mad samurai. Those men were bigger and stronger, but those ladies were not giving up. As the entourage maintained their fierce pushing, that one lady continued to crawl toward victory, and she was within about six inches of Elvis’ lips. That moment seemed like eternity. Elvis was straining toward her, puckering in anticipation of the obligatory kiss, and it must have suddenly dawned on him how ridiculous this was beginning to look, because it was taking forever, they were not getting any closer, no matter how hard they tried, and that pucker was not going to hold forever. Elvis became obviously self-conscious, blushed, began to retreat and said, in that deep, sultry voice, “Later, baby, later.” The squirming, fighting and outright melee did not let up, however, and I had positioned myself in front of one of the elevators, frantically pushing one of the buttons while trying to look completely mystified as to how this had all happened. I looked over at Joe Esposito, who was doing the same with the other elevator and said, “I don’t know why these aren’t responding Joe. I am trying!” I knew why they weren’t responding. Some college prankster had sent them off on a trip around the world, and now that we desperately needed them, hind sight was twenty-twenty. 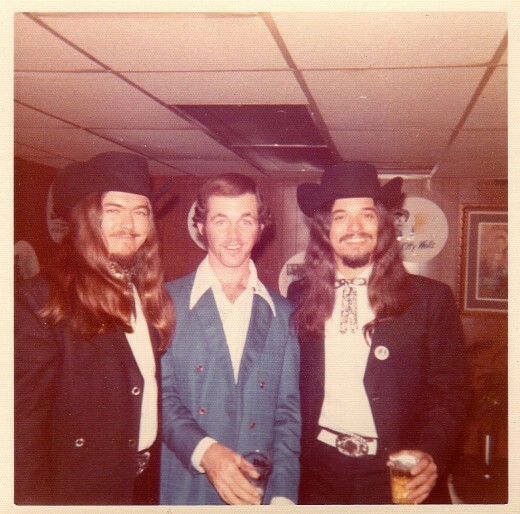 I was taken to a party for Decca Records recording artists in Nashville. This photo is October of 1972. By the way, that is soda in my glass. Brian does not drink...never has. Another photo taken at the party for Decca Records. 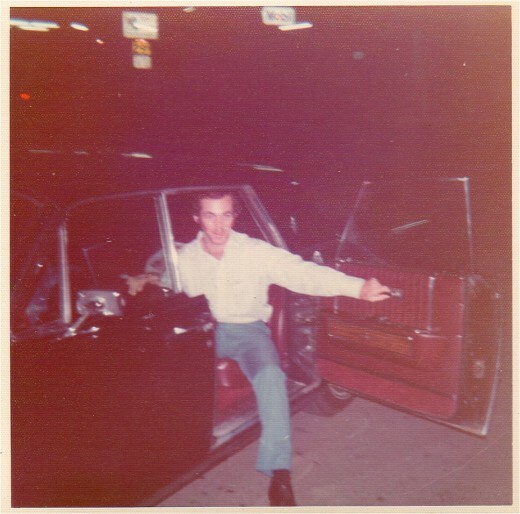 I took my friends everywhere with me in that beautiful Lincoln with the "suicide doors." or go to www.elvispresleymuseum.com and you will see it there. Elvis had a very, very close and dear friend named Jimmy Velvet, and Jimmy has this ring on his website. The photo is copyrighted, or I would post it here for you to see. I think it is up for sale as I write this article. 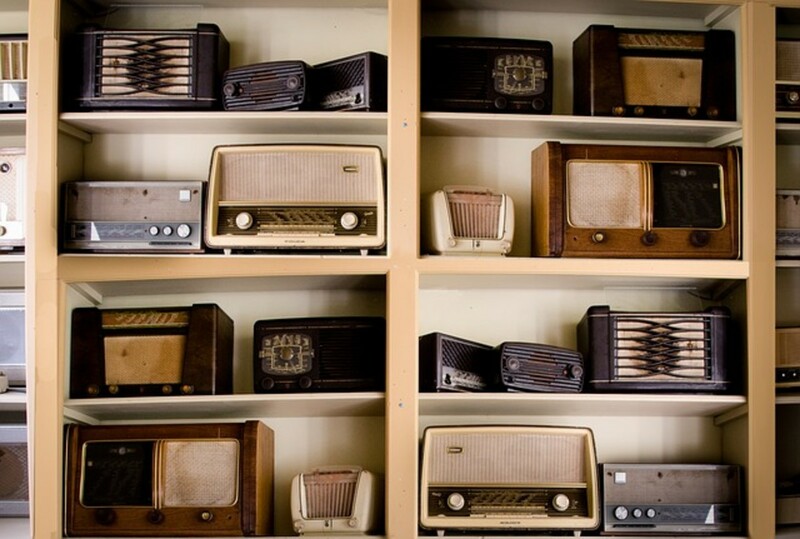 What is the Missing Link that Binds Elvis and Judy Garland asks Work at Home Grandma? Thank you for reading my latest article, and so glad that you enjoyed it. I guess I have had a fun life so far, and it's always a pleasure to share the experiences that bring a smile. Brian, thanks for sharing your story about you and Elvis. Lovely photos! 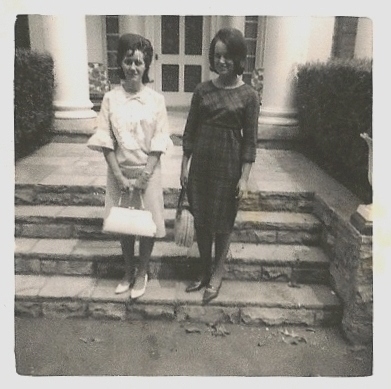 My mother and aunt were big Elvis fans back in the day. Great hub! Yes, the weather there was beautiful, and I wanted to bottle the air and bring it back with me. Brian, I am so glad you enjoyed your visit to West Virginia! It is a very beautiful state, I hope you were here during good weather, snow is currently falling as I look out the window! Thank you for taking the time to read my latest article, and so glad you enjoyed this one. Yes, I think there are a few people who would have gladly changed places with me when I was pressed together with none other than Elvis Presley. My life has definitely been eventful. I just noticed that you are from West Virginia. I was just there last week for a photo shoot. What a beautiful state! Oh what a fantastic read! Thank you for sharing this amazing tale with us, of what is no doubt an epic tale, who pranks Elvis, Lol?! I thoroughly enjoyed all the images as well! How wonderful it would be to have been close enough to see the rings in person ! You are so absolutely right about there never being another Elvis. He was totally unique, and to this day, when I am in Las Vegas and run into those Elvis impersonators, I have to admit that I do not like being around them. I know first-hand what Elvis looked like, and these guys are not even close. Elvis had a charisma that was always present, and if you looked into his eyes, let me tell you, there was an electricity that few have ever come close. 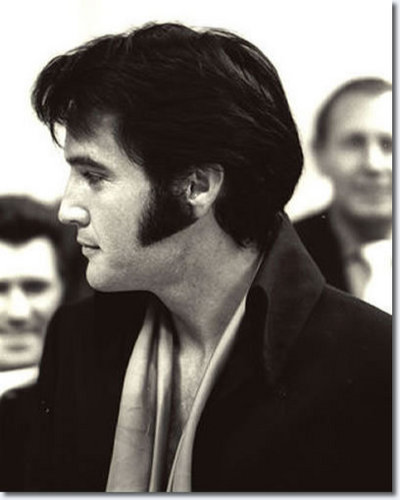 It takes a lot more than a fancy jumpsuit and black hair with sideburns to be Elvis. I can truly say, looking into Elvis' eyes was a magical experience, and his premature exit from this world was shocking and sad. 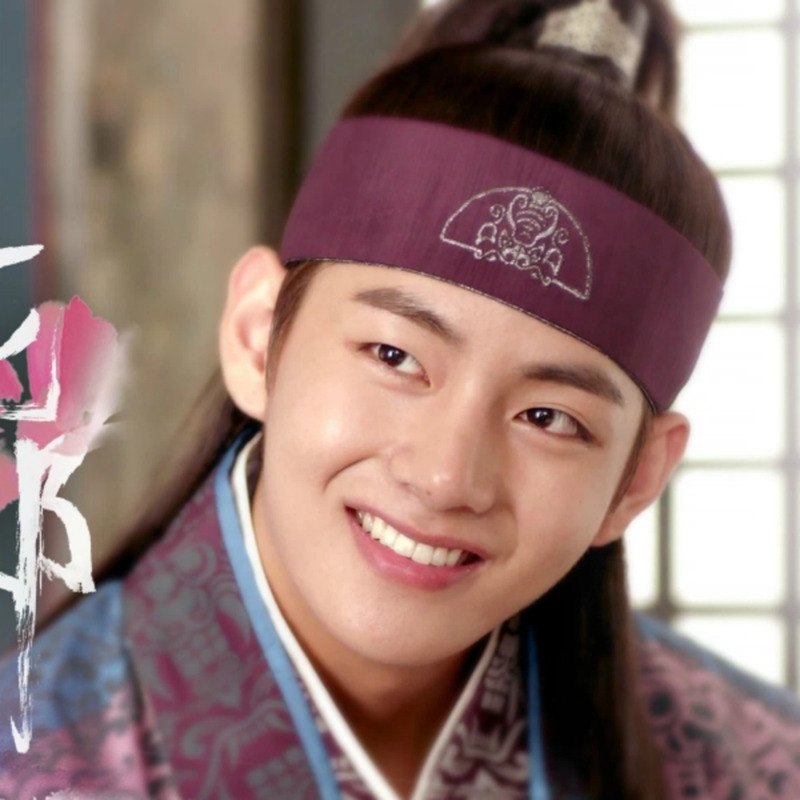 The death of his baby brother, his mother, then his own and finally his father's, all seem to point to a mysterious and melancholy karmic saga of sorts, a very moving and tragic love story that some of us got to be a very small part of. Thanks, as always, for reading my latest. 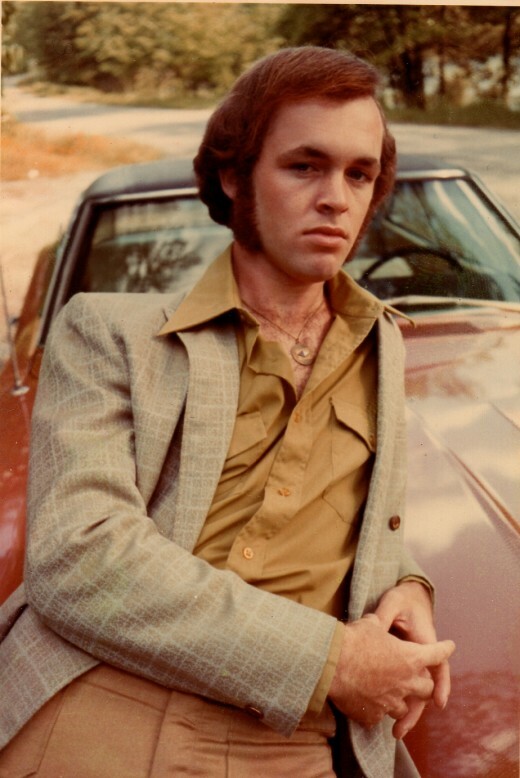 Yes, those sideburns were a sign of the times. Funny how you bring up David Carradine. When he was on the air in that old series, there were a few people who thought I should be on there as his sidekick, and even a spin off was discussed in Hollywood. Of course, we know where that all went. A very interesting article. I remember, in my prep days, going to the local movie theater in Keego Harbor, MI watching Elvis' movies when we had freedom one weekend a month. My friend, John, from New York had every record album Elvis ever cut. His father was an RCA executive in New York. I enjoyed the pictures at the beginning of the article and you look like David Carradine (spelling?) with those sideburns. Enjoyed the article. Thanks for sharing. I thoroughly enjoyed your story. I was a fan and still am today. There will never be another Elvis. I was living in Houston, Tx. the day he died. I went to a J. C. Penny store and bought a picture of him and cried all day. I am so glad you are sharing stories . Thank you and God Bless.